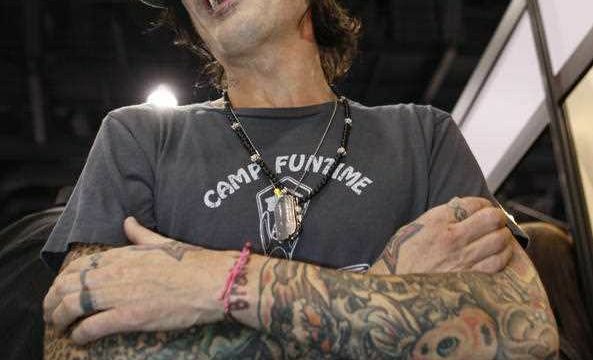 ROCKER Tommy Lee is ready to walk down the aisle ... for the fourth time. The former Motley Crue drummer is engaged to internet star Brittany Furlan - who is 24 years younger than him. Both Lee, 55, and Furlan, 31, who gained fame on the social media channels Vine and Instagram (where she has 2.3 million followers), confirmed the news on their social media channels. The couple was first linked in June 2017, when they were spotted together in Calabasas, Page Six reports. "Well this certainly beats chocolates! Say hello to future Mrs. Lee," Lee wrote on Instagram, alongside a photo of his fiancee's giant heart-shaped rock. Furlan tweeted on Wednesday, "Best day of my life!!!! I can't wait to get to spend forever with my best friend". Lee was previously married to Elaine Bergen, Melrose Place star Heather Locklear and Baywatch babe Anderson. Lee has two sons with Anderson - Dylan Jagger Lee, 20, and Brandon Thomas Lee, 21. This will be Furlan's first marriage.